Written by Dr. Ajay Singh and medically reviewed by iCliniq medical review team. Depression has been recorded in the annals of history since time immemorial, but never has it assumed so much significance as it has in today’s world. With the advent of technology today, the human society is evolving by leaps and bounds with every passing day. As the saying goes that every coin has two sides, so does this evolution. In the underbelly of this progress, lies the advent and increased prevalence of illnesses both physical as well as psychological. Both physical and psychological illnesses are a part of a vicious cycle in which the presence of one can lead to an emergence of the other. One of the most common examples of this being the prevalence of depression in diabetic patients and vice versa. According to statistics provided by WHO, depressive disorders are predicted to be the major cause of mortality and morbidity in the world in the next three years. It remains one of the most undiagnosed and undertreated illnesses, the major reason for this being a lack of awareness and knowledge among the masses and the stigma attached to psychiatric illnesses in our society. Epidemiologically speaking, depression affects one in twenty persons and occurs more in females than in males. It can be categorized as exogenous, that is, occurring due to some external or environmental stress and endogenous, which means occurring internally without any outside cause, leading to an imbalance of neurotransmitters (brain chemicals), predominantly serotonin, whose level is lowered. Primary Symptoms: These symptoms must be present continuously for at least two weeks to make a diagnosis of depression. How to overcome my depression symptoms? I have crying spells and I get angry easily. Are these symptoms of depression? Low mood and sadness, which is persistent and pervades all other mood states. Loss of interest in earlier activities of interest. Easy fatigability, loss of energy, and persistent tiredness. Secondary Symptoms: These symptoms are used to quantify depression as mild, moderate or severe. A decrease in attention span, loss of concentration, and inability to focus on daily tasks. A lowering of confidence and self-esteem. Having thoughts that the coming future is dark and bleak. Feeling worthless and loss of all hope. Having thoughts regarding dying and killing oneself. Disturbance in the sleep cycle, such as falling asleep, maintaining sleep or getting up few hours before the normal waking time. Loss of emotional reactivity as per social requirements. Rapid decrease or increase in weight. Worsening of symptoms in the morning. Treatment Modalities: There are two mainstays of therapy for depression. Non-Pharmacological Therapy: It is used as stand alone therapy in some cases of mild depression and in combination with pharmacological agents for treatment of moderate and severe depression and comprises of relaxation techniques, such as deep breathing, muscle relaxation, yoga, regular exercises, cognitive behavior therapy (which involves identifying and challenging the negative thought patterns of the patient and replacing them with positive thought process), mindfulness therapy (based on the concept of here and now, living in the present), family therapy, marital therapy, etc. 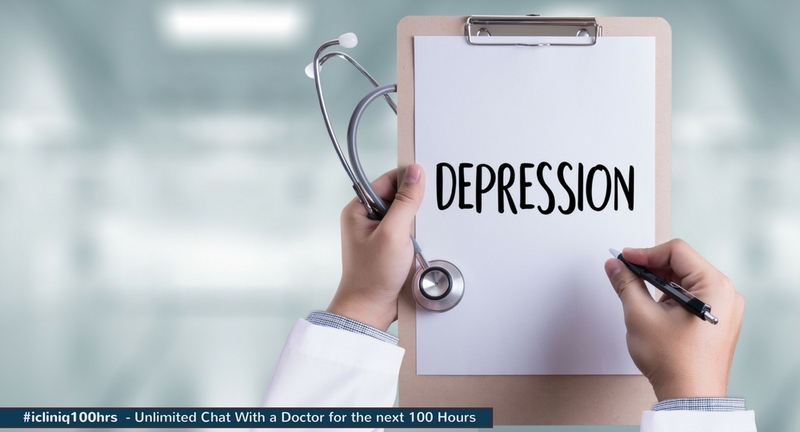 So, in conclusion, depression like other illnesses is curable, provided it is detected in time, for which both the general population, as well as the primary physicians, should be aware regarding its presentation. And just like we have screening methods for other illnesses, screening for depressive illnesses should be a part of the routine check-up of the patient. Do you have a question on Depression or Depressive Disorder? Is there a permanent solution for repeated depressive episodes? How to overcome the feeling of hopelessness?